GlobalFire's team travelled to the city of Bahia, Ecuador, to distribute Rainfresh Water Purification Units to families in need. Three hundred families received Rainfresh units, providing them with access to clean water at the household level. The units produce three litres of clean water each hour, and are designed to last the families for an entire year. The UAV teams continue to map disaster areas, focusing on locations identified by the National Secretariat for Risk Management. Near the City of Chone, mapping has recently been completed in two regions affected by landslides. AeroVision Canada's integrated UAV team members completed disaster mapping in the urban centre of the city, assessing the local university, stadium and downtown area. Further distributions of Rainfresh units have been scheduled, in coordination with the National Secretariat for Water, to provide access to clean drinking water for families affected by the earthquake. With AeroVision Canada’s team arriving in country, GlobalFires’s capacity to provide UAV mapping services for the Government of Ecuador continues to increase. In the region of Jama, the UAV team deployed an Aeryon Labs’ Skyranger UAV system to conduct disaster assessments in areas affected by landslides. The emergency water team travelled to GlobalFire’s Trekker Water Purification Unit installation locations to ensure that the units were functioning properly and providing clean water for the thousands of local community members they serve. Community leaders confirmed that the units continue to work and provide access to safe drinking water. In partnership with the National Secretariat for Water, additional locations for Trekker installations were also identified. The team continues to assess the hygiene and water needs of those affected by the earthquake. As GlobalFire continues to expand its UAV mapping response, an additional team of Canadian pilots prepare to deploy to Ecuador. In partnership with GlobalFire, the team from AeroVision Canada will help to increase UAV flight capacity in-country, responding to the growing number of requests from the Ecuadorian government. They follow another team of GlobalFire trained pilots, who arrived in Ecuador yesterday to join the ongoing UAV operation. Using Aeryon Labs’ Skyranger and Scout model UAVs, mapping was completed in three locations affected by landslides near San Vincente. The team now moves with National Secretariat for Risk Management liaisons to Pedernales, to conduct further flights. In the town of Los Ranchos, the emergency water response team installed a Trekker Water Purification unit to provide the population of over 1,400 with access to safe drinking water. Prior to this installation, the locals had been forced to boil water retrieved from a ground reservoir. Meeting with experts from the National Secretariat for Water, the team looks to implement an AR3 Water Purification Unit in a nearby camp to meet the water needs of it’s displaced residents. In response to the National Secretariat for Risk Managements requests to expand GlobalFire’s UAV mapping program, another team of pilots departed for Ecuador early this morning. Travelling with them is an additional Aeryon Labs Skyranger, to be deployed alongside the team’s UAVs already active in-country. On the ground, the team in Ecuador continues to work with the Secretariat mapping the disaster area in Tarqui. In coordination the National Secretariat for Water, the team has identified two further locations to implement WASH programming. These communities will each receive a Trekker Water Purification Unit to serve their populations needs, while further preparations are made for the distribution of Family Emergency Kits and an AquaResponse3 water purification unit. The AR3 will be able to provide up to 4,000 people with their daily drinking water needs. In partnership with Waterloo-based Aeryon Labs, the UAV team continues to map the disaster area in the City of Portoviejo. Coordinating with the National Secretariat for Risk Management, the team has produced detailed maps of the area using its Skyranger UAV unit. Responding to further requests for mapping throughout the province of Manabi, additional UAV pilots are deploying to Ecuador tomorrow. This mapping data provides crucial information to responders, increasing their efficiency and capacity to deliver aid. In Canada, members of the Ecuadorian community joined GlobalFire and GlobalMedic at Ferno Canada’s headquarters to prepare 990 Family Emergency Kits for those affected by the earthquake. The kits include Rainfresh Water Purification Units, in addition to essential hygiene items, such as toothbrushes, toothpaste and soap. These kits are en route to be distributed in Ecuador and support the health of more than 5400 earthquake-affected people. The emergency water response on the ground continues, as a third Trekker Water Purification Unit was installed by the team in Casino, Portoviejo. Prior to the earthquake, a flood had struck the community, contaminating the river and their primary water source. The earthquake then destroyed the riverbed, desperately increasing the community’s need for clean water. In addition, 15,000 people now have access to safe drinking water through the distribution of Aquatab Water Purification Tablets. One week after Ecuador was struck by a 7.8 magnitude earthquake, the country has experienced over 700 aftershocks. The death toll has risen to above 650, 26,000 people have been displaced and thousands of buildings destroyed or damaged. In a continued effort to provide clean drinking water for those affected by the earthquake, GlobalFire’s emergency water response team installed Trekker Water Purification Units at two sites, with a combined need of over 2,400 people. The first site, Aeropuertos Realles Terminado, is home to 1,000 people who lost their homes during the earthquake. Following the disaster, the people had been receiving an unsustainable supply of donated bottles as their primary source of clean water. GlobalFire trained airport workers on the operation of the Trekker units, allowing them to serve the water needs of the entire camp. At the second site in Calderon, GlobalFire instructed community leaders on the use of the Trekker unit, providing water for 1,400 people in the immediate and surrounding communities. A third Trekker unit installation is currently being coordinated with the National Secretariat for Water, in addition to the delivery of 80,000 Aquatab Water Purification tablets. The UAV team, in partnership with Aeryon Labs, performed damage assessments and compiled mapping data of the most heavily affected areas in Portoviejo. With approval from the Ecuadorean government, GlobalFire’s team deployed their UAV units to help assess damage in Portoviejo. Escorted by officials, the team’s professionally trained pilot used the units to compose aerial imagery of severely damaged buildings and to map the disaster area, providing the information to local responders. Working with the National Secretariat for Water, the team continues to identify potential sites for the operation of newly arrived Trekker Water Purification Units. Supported by the Minister of Water, the team will receive nearly a thousand Family Emergency Kits in the coming days, including Rainfresh Household Water Purification Units, from GlobalFire’s headquarters in Canada. These units also contain hygiene items, such as toothbrushes, toothpaste, and soap, to be distributed to families in Ecuador affected by the EarthquakeThe items distributed will also include 80,000 Aquatab water purification tablets, providing an additional 800,000 litres of safe drinking water. The AR 10 point-of-source water purification unit continues to be operated by trained local responders, producing 2,400 litres each hour. Ongoing Search and Rescue efforts by the team responding with Ground-Penetrating Radar are focusing their efforts on high-priority locations identified by authorities. GlobalFire’s team has initiated an emergency water response, ensuring access to clean water for those affected by Saturday’s earthquake in Ecuador. Working with Ecuador’s National Secretariat for Water to establish locations in the greatest need, the team trained local responders on the operation of an AR10 water purification unit. The point-of-source unit delivers 2,400 litres of clean drinking water during each hour of operation. With the unit set up to be operated by local responders around the clock, it will substantially increase their ability to provide safe water to the affected population. A team carrying 80,000 Aquatab water purification tablets, enough to provide 800,000 litres of clean water, in addition to three Trekker point-of-source water purification units are en route to the country. These units will be assigned to locations identified by the GlobalFire team and the National Secretariat. Search and Rescue teams in-country continue to scan buildings in areas of major structural collapse, coordinating priority locations with the local police and fire departments. Using Ground Penetrating Radar (GPR) and a team of rescue dogs, the team is working to identify signs of human life beneath the wreckage. GlobalFire's team is deploying its UAV units later today, to assist with with emergency mapping and damage assessment. 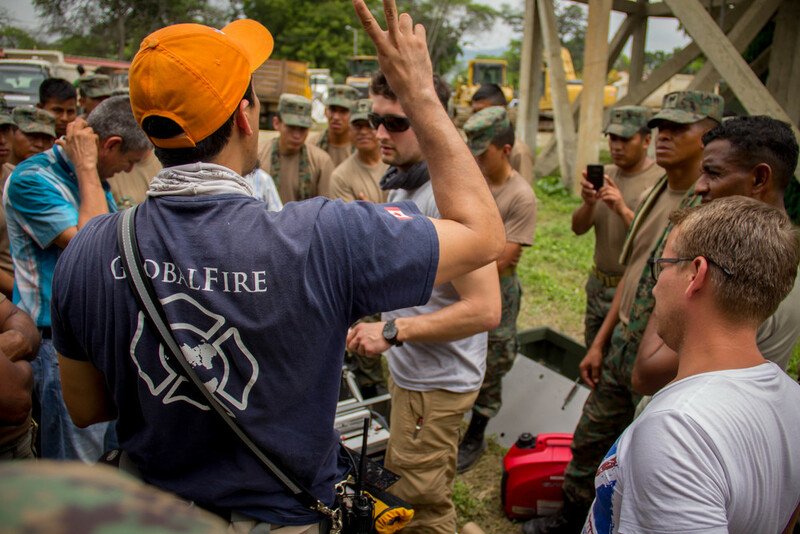 Upon landing in country, GlobalFire’s team of Canadian rescuers travelled to Manta, Ecuador, where they received a briefing from and partnered with the City of Duran's Fire Department. The team was then brought to Tarqui, where they deployed Ground Penetrating Radar to assist with the search for signs of life under the rubble. Following efforts in Manta and Tarqui, a communications centre was established in the Manta football club facility. The team rested there before resuming travel in the morning, experiencing a 5.5 magnitude aftershock overnight, the largest of 444 aftershocks felt since the earthquake. With all members safe, the team met at the provincial command centre the following day in Portoviejos and were assigned a high-priority response to a seven story building collapse. The response was prioritized as a 911 call was received from a person reported to be trapped beneath a series of buildings and collapsed homes. Arriving on scene, the team began gathering information from the community, identifying seven people from the area who where still unaccounted for. A police and military detail were assigned to help, clearing the area, while officials called for silence as the team operated the GPR in search of survivors. A Search and Rescue dog team was brought in after a potential opportunity was identified, while a dig team of firefighters was readied. Unfortunately, further scanning confirmed no signs of life. The team continues to conduct needs assessments to deliver food, hygiene, shelter and water resources to those in need. They are also installing an AR-10 point of source water purification unit to provide immediate access to clean water at a rate of 40 Litres per minute. GlobalFire’s team is en route to Ecuador to provide aid to those affected by Saturday’s earthquake. Latest updates have seen the death toll rise to 350, with over 2,500 injured and an estimated 100,000 in need of aid. The count is expected to rise as rescuers work to free those trapped beneath collapsed buildings. UAVs for emergency mapping and damage assessments travel with the team, and will be deployed upon arrival to collect critical imagery of the disaster zone. In addition, Ground Penetrating Radar Systems will be used to help identify signs of human life beneath the rubble, and determine where rescue teams should focus their efforts as they continue to fight to save lives. An AR10 water unit will also be set up immediately to deliver clean water, producing enough to serve the needs of 15,000 people a day. A massive 7.8-magnitude struck Ecuador Saturday evening, killing at least 235 people. With more than 270 buildings entirely destroyed, a state of emergency has been declared as rescuers work tirelessly to locate and free people who have been trapped under the rubble from fallen homes and buildings. Landslides have made it difficult for emergency workers to access all areas. Road closures and airport closures have made it harder for rescuers to reach damaged areas. 1. Specialty Search and Rescue Teams are en route. Initial teams will be operating Ground Penetrating Radar Systems. This system uses microwave sensors to detect any heartbeats or breathing in the rubble of collapsed buildings. Canadian firefighters and rescue workers were immediately deployed to operate this equipment to help triage which locations rescuers should dig in their desperate attempt to save lives. 2. We are deploying Unmanned Arial Vehicle (UAV) Teams. These teams will be performing emergency mapping and damage assessments. The images and information gathered will be shared with rescue teams and humanitarian clusters to increase the capacity of the local and international rescuers to save lives. 3. Teams are on standby to provide medical aid, install field hospitals, install critical infrastructure tenting, and install large scale water purification units as needed. The initial rescue team is carrying in mid-size water purification units. 4. Teams will be ready to distribute material aid, such as Non-Food Items, Rainfresh Household Water Purification Units, Food Kits, Shelter Kits and more. Using this multi-phased approach, GlobalFire will have a significant impact in the emergency response and recovery period of this devastating earthquake in Ecuador.